The statistics related to points are calculated based on the real number of points awarded at every tournament. 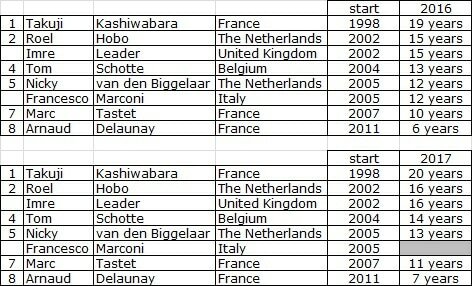 In 1986 and 1987 less players (top 6 instead of top 10) received less points (90 instead of 200 for the winner). These points have been taken into account for the statistics calculation. Throughout the years 371 players scored points, that is over one-third of all players that ever participated in a tournament. 26 of them crossed the amount of 1000 points. 28 different countries are represented among the players. Some countries have many players who scored points over the years, other countries had less players (but with a higher average). 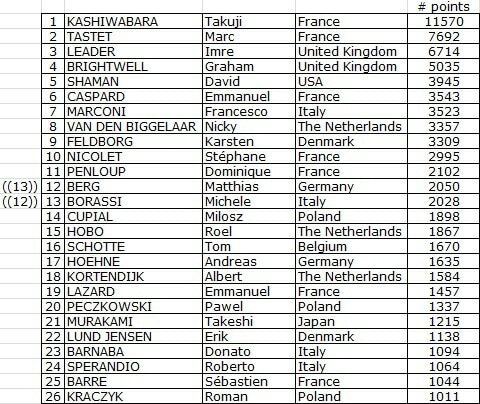 It is predictable that countries hosting an EGP tournament are higher in this list than others. Japan is the exception in this list at position 7. 27 players scored points in 10 or more seasons. 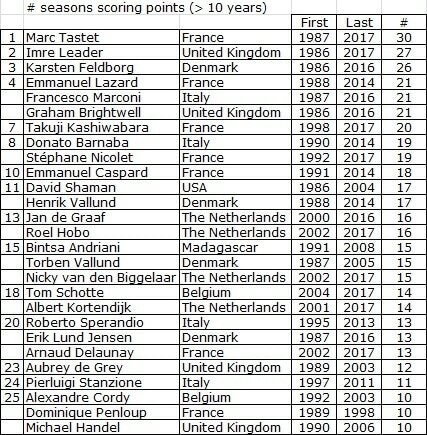 No one managed to score in all seasons, but Marc Tastet comes pretty close! It is hard to score EGP points year after year. At the moment only 8 players managed to score at least the last 5 seasons. Arthur Juigner can join the list in 2017. Two players, Francesco Marconi is still at risk and has 3 tournaments remaining to participate and score.